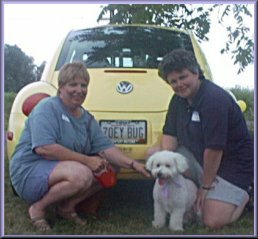 Carol Baker and her friend, Carla with their fluff, Zoey and "her" Zoey Bug from Cincinniti. 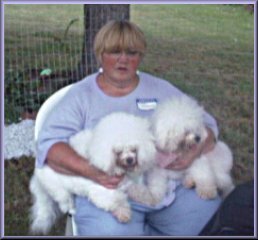 Bobbi Komaromi from Newfield, NY with two of her five Bichons that attended - Cloud and Cotton. 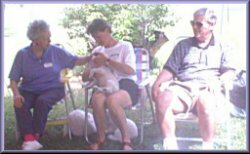 Bobbi made all of the bandannas for our 1st bash. 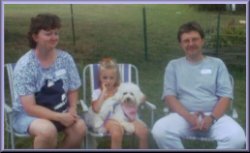 Leta Ladd from Colts Neck, NJ with Vivian & Bryce Yorke from Kingston, Ontario Kathy & John Witko came from Avoca, PA with their daughter, and Bichon, Lacee.